Getting to Plockton couldn't be easier, it's at the very heart of Scotland's magnificent west coast, with the village linked by a number of road, rail and bus routes. You can even come via Skye on the Mallaig to Armadale ferry and enjoy a crossing of just 30 minutes, with stunning views the Small Isles, Knoydart, Skye and the mountains beyond. Mackenzie's is less than two hours from Inverness by road, or around 4-5 hours from Glasgow and Edinburgh. If you happen to have your own plane then the airstrip welcomes private flyers and we can arrange transport from the airfield. And if you want to come to Plockton by train then we have our own station on the world-famous Inverness to Kyle line. If you come by bus or coach then we are just 6 miles from Kyle. To help you get to Plockton we've shown a few ideas below and if you need some further information please get in touch! If you are coming from the south then you'll travel from Fort William via the A82 turning off at Invergarry for the A87 to Kyle of Lochalsh and Skye. A few miles after Eilean Donan Castle turn right at Balmacara for Plockton which is about 7 miles via some beautiful country roads passing lochs and mountains. If you are travelling from Inverness via Garve and Achnasheen on the A9/A835 and A890 turn right past Stromeferry at Achmore and take the Duncraig road to Plockton. The house is on Harbour Street just a few doors beyond the Plockton Hotel. Click the AA Route Planner to help you plan your trip. Plockton is 2 1/2hours by rail from Inverness on the Kyle Line and in the summer months there are 4 services a day in both directions. With prior arrangement we can pick you up from the station. The rail journey from Inveness to Plockton is often voted one of the most scenic journeys in the world and occasionally steam trains run on the line operated by charter companies. Scotrail's website has all you need. Plockton is often a popular stopover for visitors travelling on the west coast, or heading to and from Skye and the Western Isles. There are Citylink coach services to Kyle and beyond from Glasgow, Fort William and Inverness with a local bus service to Plockton. The services are normally 3-4 a day to the main cities, but local bus connections are infrequent. We would help to help you plan your trip if you don't have a car. 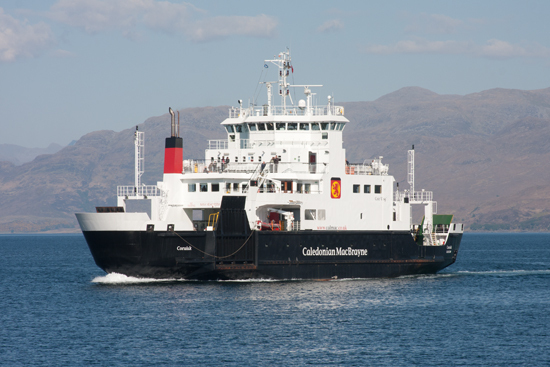 Scotland's Highlands and Islands are connected by a network of ferry services operated by Caledonian Macbrayne (CalMac) and many visitors come to Plockton having travelled from Mallaig to Armadale in Skye or from Stornoway in the Western Isles to Ullapool. Bookings are always advised and for full details of CalMac's services click here. Whatever way you choose to come to Plockton you'll travel through some of the finest scenery in Britain, with a stunning new vista at every turn, so don't forget to bring your camera. If we can help you plan your visit just give us a call.